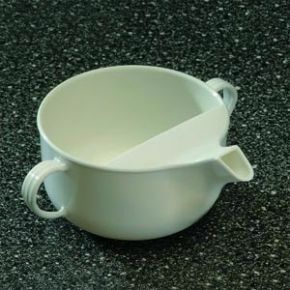 Especially useful for users with physical disabilities or dexterity issues, this white plastic teapot feeder cup is a two handled, non spill mug with a difference. It has a teapot style spout that allows the cup to be used a less steep angle when drinking. With a partially covered lid to help prevent spills.